San Diego River Flood Warning System (CA) | WEST Consultants, Inc. 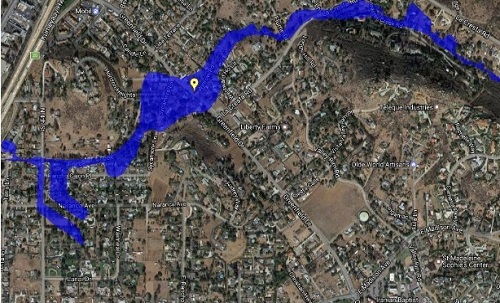 The County of San Diego (County) tasked WEST Consultants with the development of a flood warning system for the San Diego River watershed that would help the County predict the magnitude of an upcoming flood and provide decision making information for the County to gage the appropriate level of response. The San Diego River is one of the major rivers within San Diego County and as such is a source of flooding for unincorporated County areas as well as the cities of Santee and San Diego. The San Diego River and four of its main tributaries (Boulder Creek, San Vicente Creek, Forester Creek, and Los Coches Creek) are incorporated into the HEC-RTS (Real Time Simulation) model of the San Diego River watershed. A web site with static flood maps was also prepared for the County as part of this work. MFP: Meteorological Forecast Processor. MFP combines the forecasted precipitation with the observed precipitation. HEC-HMS: Hydrologic Modeling System. HEC-HMS computes flows from the combined precipitation. In a forecast mode, HMS uses observed flows up to the time of forecast, then “blends” future flows to produce hydrographs. HEC-RAS: River Analysis System. HEC-RAS computes stages from HMS’s hydrographs and river cross sections. After a forecast has been completed, a script may be run which will display color bars which compare forecast flood stages to bridge deck elevations. The script will also generate text file output if flood thresholds are exceeded. The County can mobilize road crews and take other appropriate measures based on the forecasts.